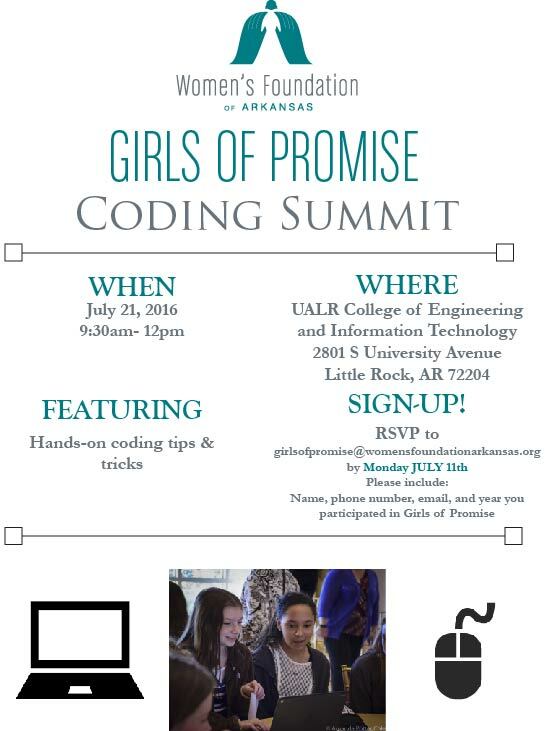 The Women’s Foundation of Arkansas and Girls of Promise ® are partnering with the UALR College of Engineering and Information Technology to host a free Coding Summit for Girls of Promise ® alumnae on July 21, 2016. This coding summit will gather high-school aged girls from around the state, who have previously taken part in our Girls of Promise Initiative. The Girls of Promise program is designed to educate young women about career opportunities in STEM fields (Science, Technology, Engineering, and Mathematics). The Coding Summit, serves as an enhancement to our program portfolio providing these girls with a unique learning development opportunity. Our July Summit will feature a hands-on interacting coding session where girls will learn some basics of how to code, hosted on the UALR Campus, led by volunteers. Our aim is to not only introduce but to also nurture girl’s interests in career and educational pursuits. The deadline to sign up for the July 21st Coding Summit is Monday, July 11th. If you are an alumna of Girls of Promise ® all you have to do to register is email girlsofpromise@womensfoundationarkansas.org with your Name, Email, Phone Number, and Year you participated in Girls of Promise ® and we will get you signed up! Miss the deadline? Email us to see if spots are still available! We know that women who receive better educations are employed in higher paying jobs, and therefore can make a better living for themselves and their families. Education for women & girls in Arkansas is critical for our state to continue to grow and thrive.